In this instructional article we describe how to build a bookcase using our dowel jig system to create the strongest and most accurate joinery possible. 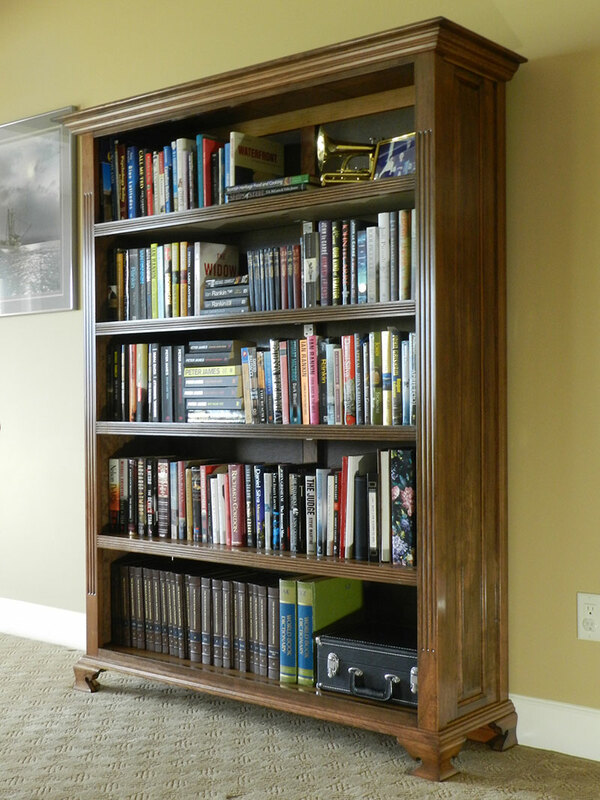 The design of the bookcase project features four Chippendale feet, and five shelves. The wood used for the main structure is Cherry, with MDF used for the shelves. The project is built using 99% multiple dowel construction. Finished design of the bookcase built in this article in use at Jims home. 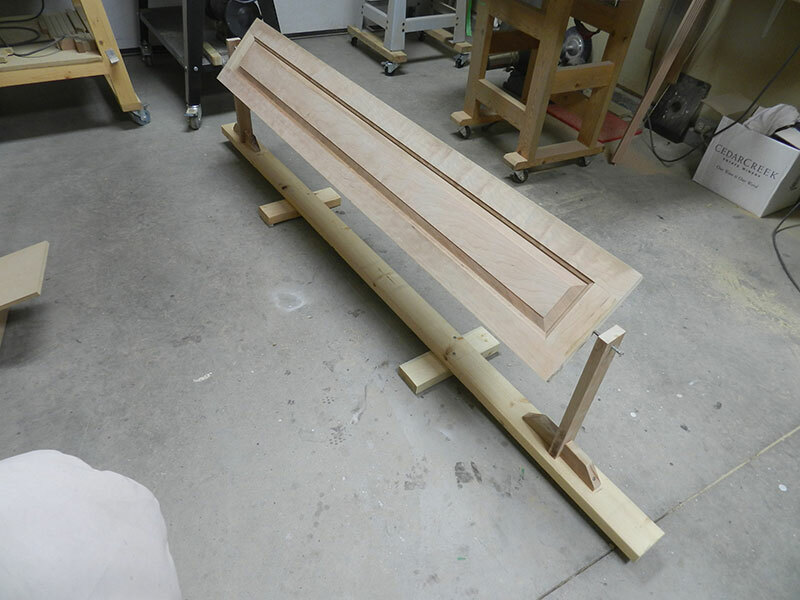 I began the project by preparing the wooden blocks for the Chippendale feet, and in order to save material, I planed, glued and clamped 3 pieces of 7/8 inch x 3 1/2 inch x 12 inch long cherry. Two of these laminated sections will make up the 4 Chippendale feet. 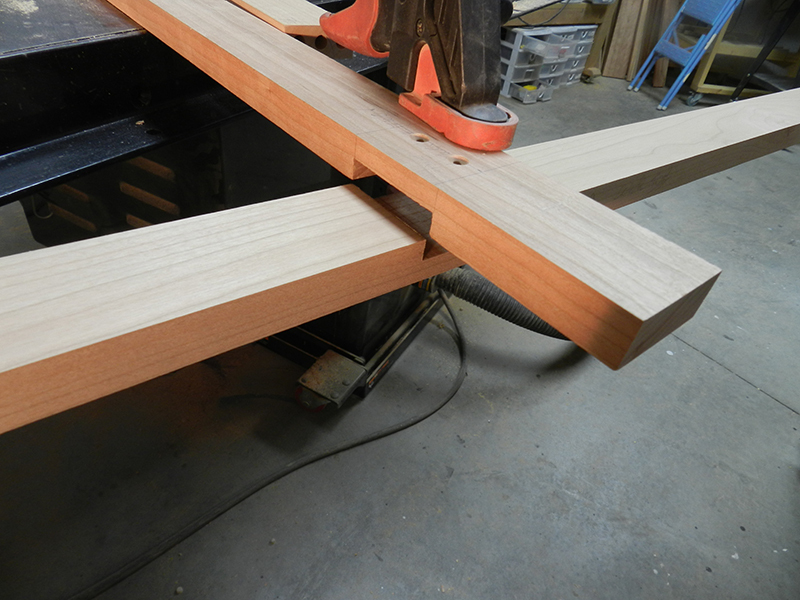 Three cherry work pieces glued and clamped together into one piece for construction of the Chippendale feet. 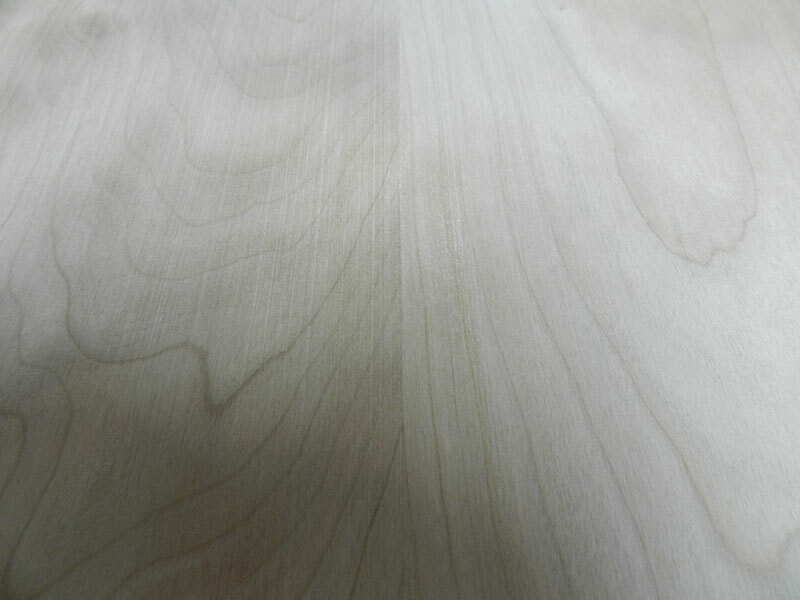 Once cured, the piece is planed, the ends trimmed using the table saw sled and is then sectioned into 2 – 1 1/4 inch pieces. The Chippendale feet work pieces after planing and trimming. These 2 pieces will account for 2 complete feet. The completed sections should measure 1 1/4 x 3 1/2 x 12. Using test pieces, set the table saw blade at 45 degrees exactly, and calibrate the mitre guide within the table saw track to ensure a true cross cut. 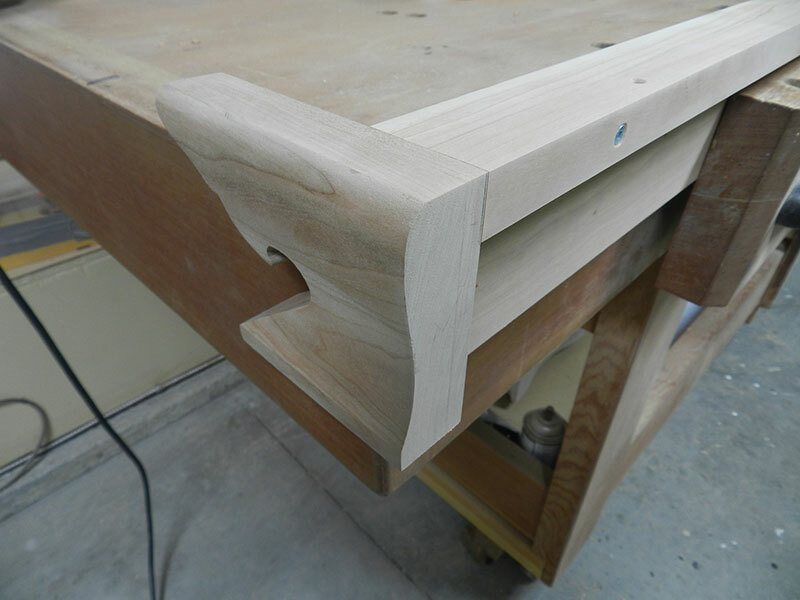 After the 8 mitres have been accurately cut, it is now feasible to accurately place the dowel hole in each mitre face and further, this can be done before the outer side wall of the Chippendale feet are shaped. Reference check marks on the top edge face only, and for this thickness of stock, install a 3/4 inch spacer between reference block and 45 degree mitre accessory. As a consequence of the surface area in contact, and a soon to be installed inner attachment, in all probability 2 dowels on each face would suffice. 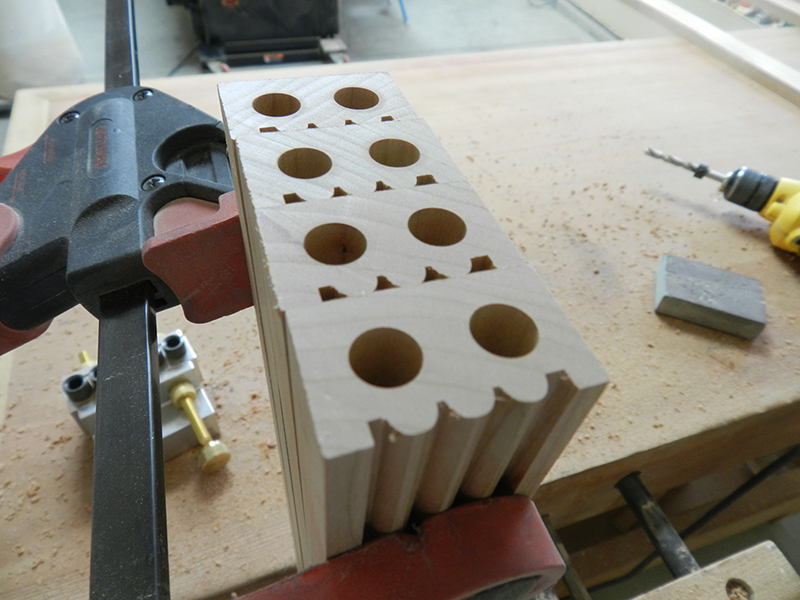 I have however elected to install 4 dowel holes, omitting the centre dowel hole, #3 (refer to video). The finished book case will be positioned free standing against the wall, consequently we want to avoid ogee feet projections at the rear of the structure. To that end the two outer components comprising the rear ogee feet will be shaped as normal, whereas the rear transverse components of the ogee feet will remain untouched and flush with the back panel. Initially it was my intention to install 4 dowels in the mitre arrangement, each one 3/4 inch deep, using 3/8 inch dowels, however subsequent measurements revealed that with respect to dowel hole #3, (from the top), this dowel was too close to the concave section of the ogee shape. I therefore elected to omit that dowel, however the required strength is maintained. The next step involves shaping the ogee contour on the front face of the 12 inch mitred component. Each 12 inch section of mitred cherry comprises one complete foot, consequently, once shaped, 2 sections should mate perfectly. 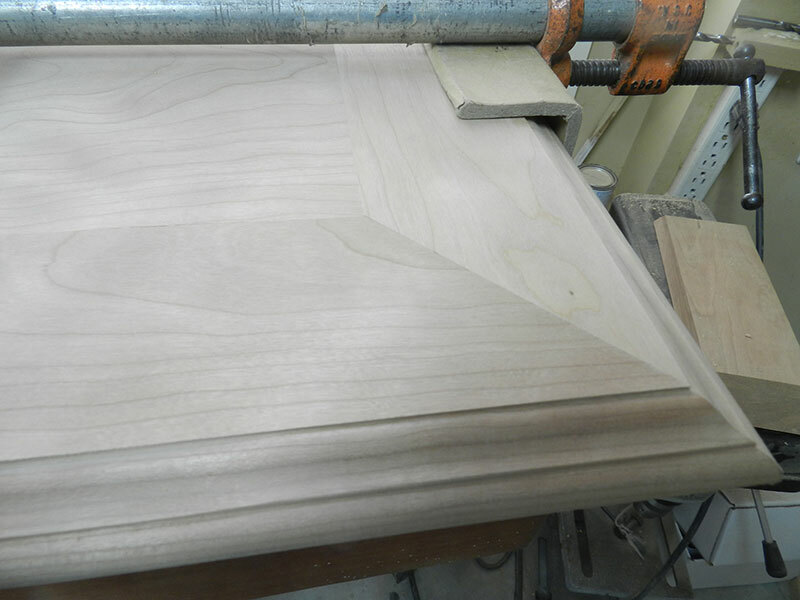 The concave section is carefully completed on the table saw. 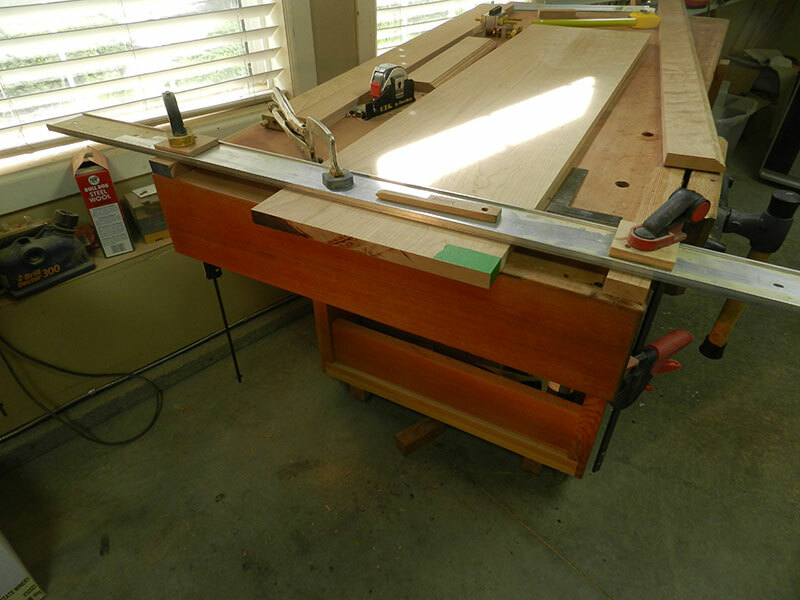 A strong bare batten is used to act as a fence, however placed diagonally and clamped to the front and rear of the table saw bedplate. There are various factors which are extremely important and great care should be taken with this installation and procedure. (1) The wooden batten or fence must be placed between the operator and the blade. Table saw rotation is towards the operator, and the fence must take up the load imparted to the work piece by the blade rotation. (2) The relative angle between batten and blade should be 45 degrees and preferably less. This to reduce the side loading on the table saw blade during the various passes. 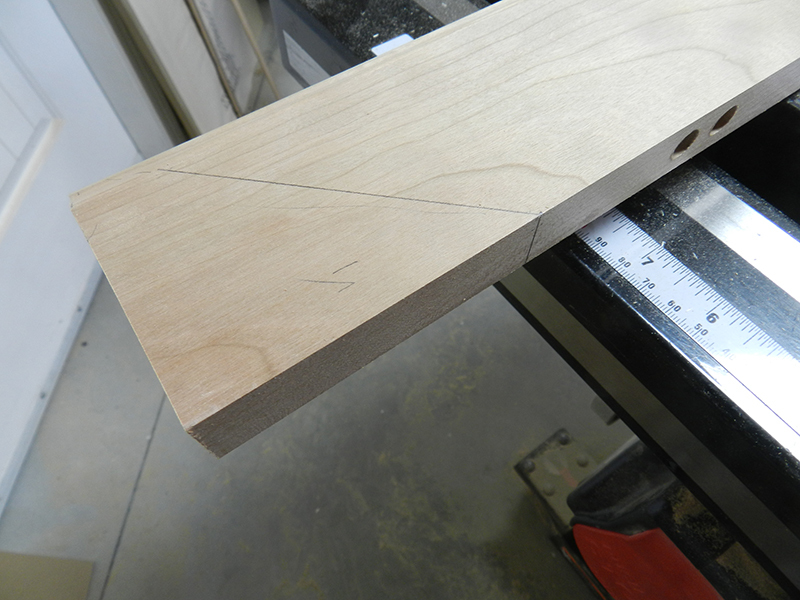 (3) Again to reduce that side load, make small cuts, the initial cut being 1/8 inch or less. (4) On each pass, make the cut slowly. (5) Initially, use a test piece to ensure that when the concave cut is complete, a shoulder approximating 3/8 inch height remains at the lower segment of the foot. 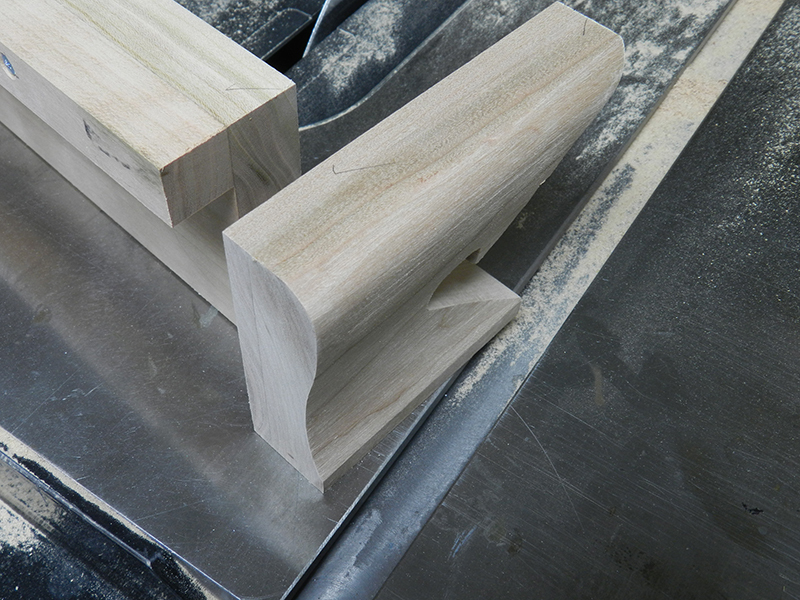 (6) Once the concave section has been milled, use a suitable plane to round the two uppermost corners, i.e. the top corner and corner adjacent to milled section. (7) Sand to 220 grit. 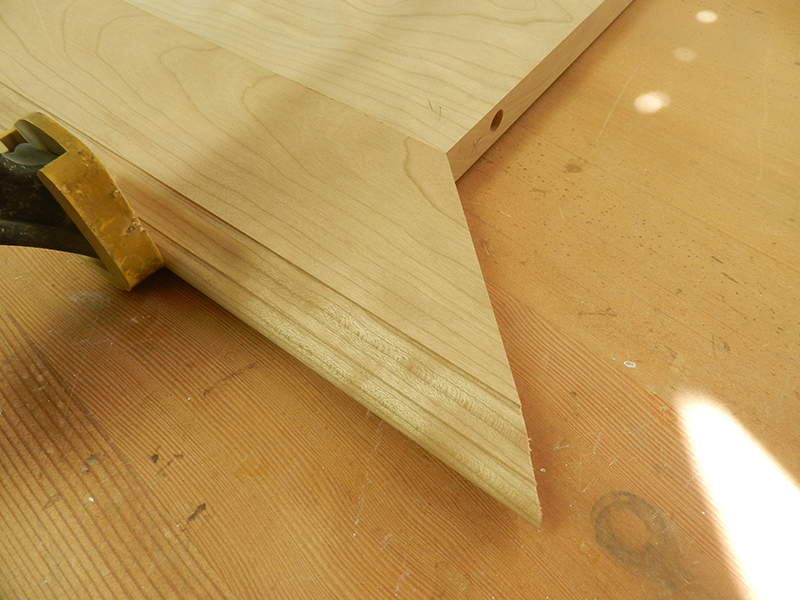 (8) Use 3 dowels to join the 2 mitred faces of the Chippendale feet. 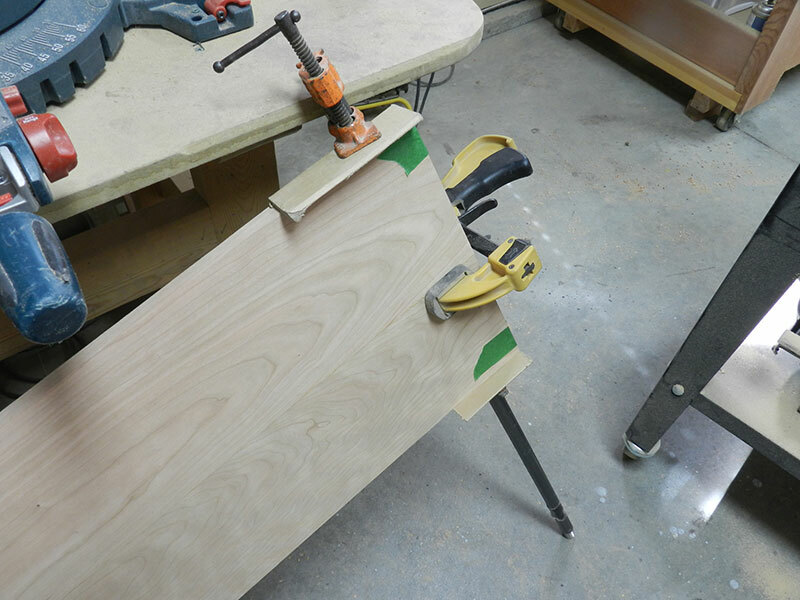 As stated previously, the book case will be mounted against a wall and the combined width of the Chippendale foot plus the base board will place the structure approx. 2 inches from the wall. I will therefore omit the rear sections of the Chippendale feet and install a transverse rail which will be used to support the book case weight, and further, provide an attachment from the rail to the lower rear transverse member of the book case. A 3/4 inch x 3/4 inch batten will be secured to the rear transverse member, which will measure 7/8 inch x 3 1/2 x 4 ft. 3 3/4 in. The batten will be located at the rear face of the rear transverse rail, and will be used to secure to the lower section of the book case. 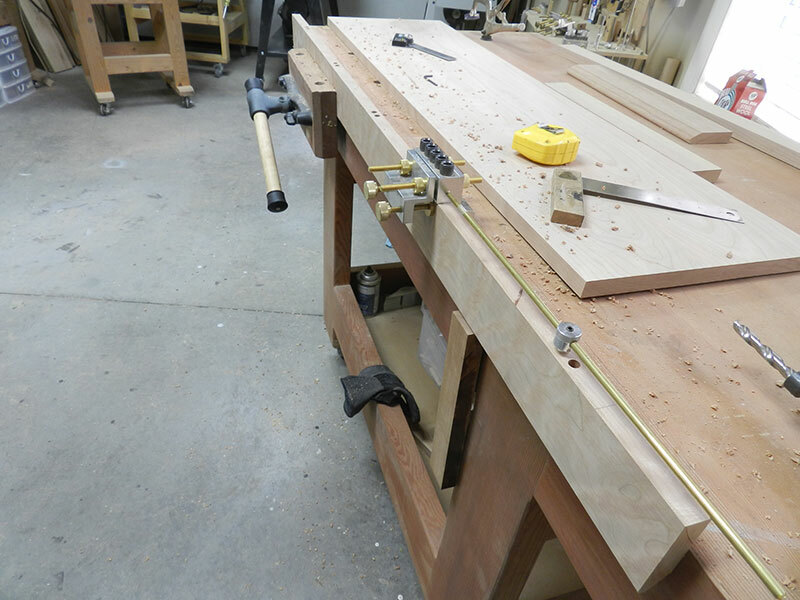 The rear rail will be secured to the rear Chippendale feet using 4 x 3/8 dowels. Due to the position of the batten, the dowels will be set in 13/16th of the aftermost edge of the Chippendate foot (photo 2851) and (2852). Spacers totalling 13/16 in. were used with Dowelmax in the 2nd configuration (face joint) in order to align the rear section of the foot to the rear section of the 3/4 x 3/4 in. batten. The two outer verticals comprising the front frame, measure 7/8 in x 2 1/4 in. x 68 1/4 ? These verticals will be decorated with 3 vertical flutes per side, the length of same approx. 50 inches. In the past, I used the router and fence for milling the grooves, the procedure used was tedious and trick to align properly. 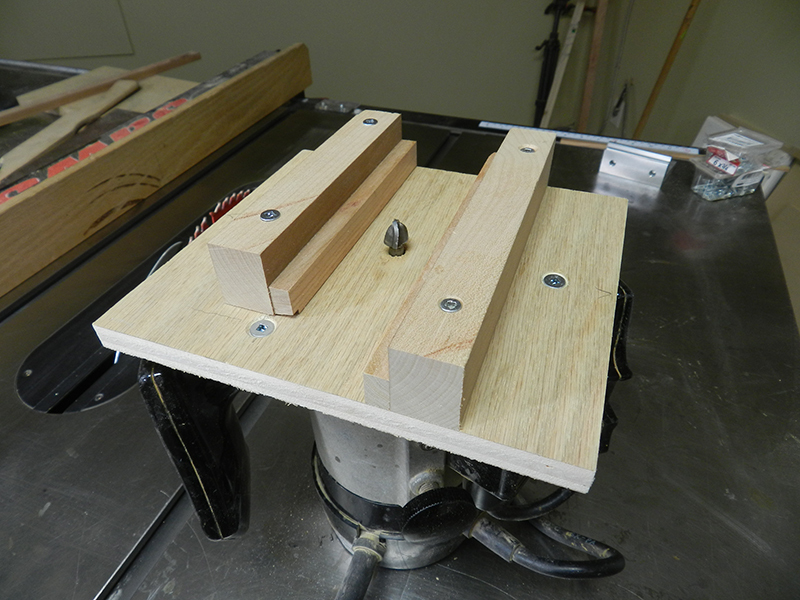 I decided therefore to design and construct a simple wooden jig. For the base I used 1/2 inch plywood and the base measures 1/2 inch x 6 3/4 x 7 1/4 in. 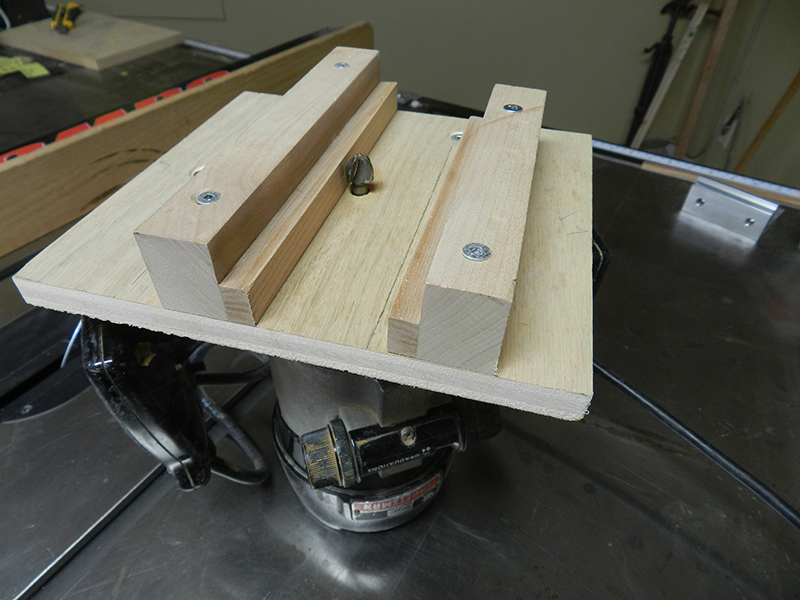 The face plate is removed from the router and used as a template to attach the plywood base plate to the router, using the 3 machine screws. 2 – 1 in x 1 in guides are attached to the base plate using screws 2 1/4 inches apart, properly centred and used to position front vertical. 2 inner bearers are glued to the guide bars to allow clearance for the router bit. 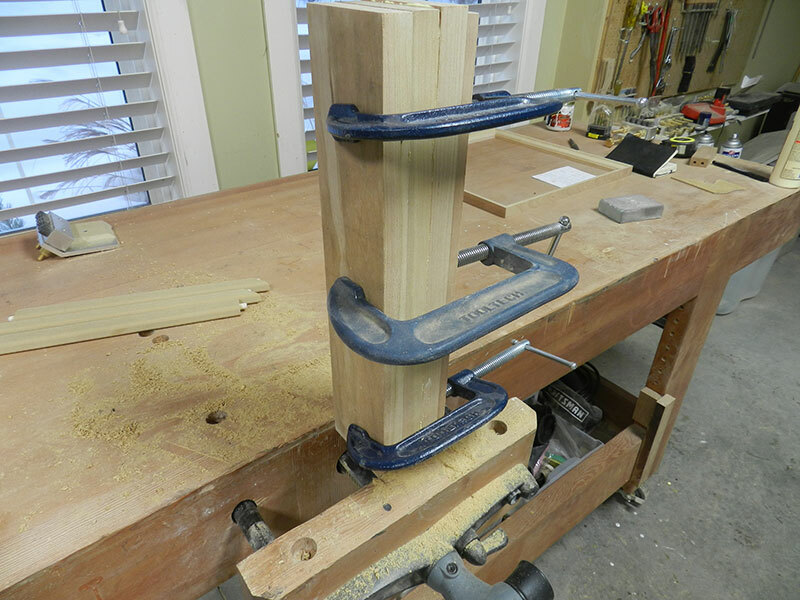 Position the jig on the vertical, lower the router bit until it touches the vertical, then adjust the bit to take a cut, depth approx. 1/16 in. 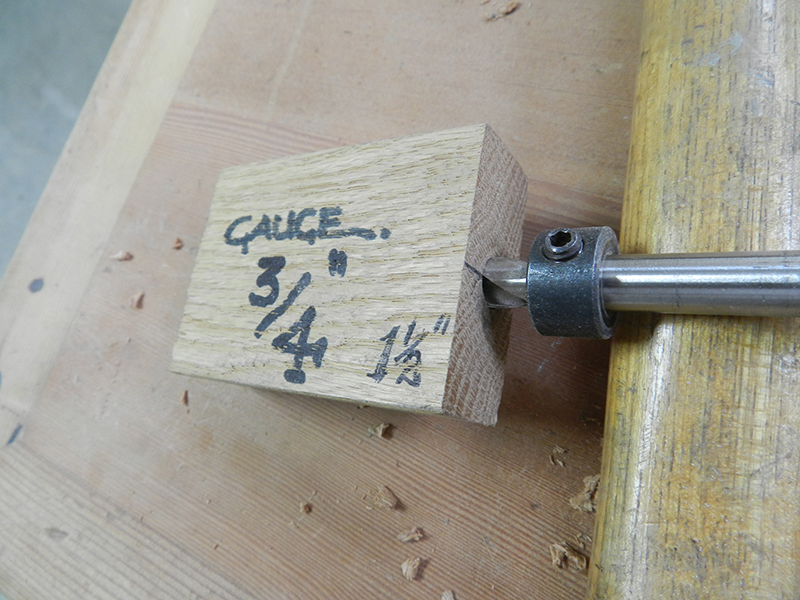 The beauty of this jig is that although there are 3 flutes, only 2 settings are required, i.e. the centre and one outer groove. Both ends of the jig are equidistant, therefore the device can be rotated 180 degrees to do the third flute. In that manner the position of the two outer grooves will be identical. I am using the raised panel system for the design of the book case ends, the design provides a relief of 1/4 inch at the corner posts. Overall dimensions of the end panel: 7/8 x 14 x 67 5/8 inch. Styles: 7/8 x 2 3/4 x 67 5/8 in. Rails: 7/8 x 2 3/4 x 5 3/4 in. Centre panel: 5 3/4 x 62 7/8 in. • Leave dimensions minimally oversize to allow for trimming after dry fit (widths of rails and stiles). I use the mitre gauge with an absolutely square elongated attachment in order to guide the edges through the router bit. This procedure becomes a bit tricky with the centre panels which are approx. 6 ft. long. Fortunately I designed my work bench to finish up exactly the same height as the router table, so it provides a support for the long length. I also used a sheet of wax paper to reduce friction at the end opposite the cutter, and also extended the fence on the mitred guide, to further support the 6 ft. long work piece. Once the face panels have been glued, clamped and cured, it is time to begin construction and assembly of the rear posts. A function of this design is to incorporate offsets at the raised panel area, leaving the inside wall flush to allow insertion of the various shelves following assembly. 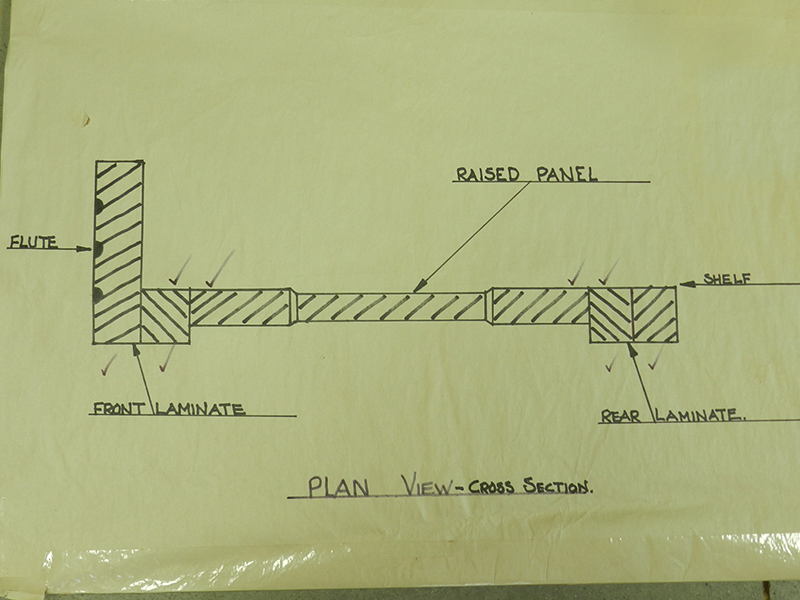 A plan view of the corner post and raised panel section is shown below. To allow for the 1/4 inch offset between the raised panel and the rear post, and to provide similar thickness for the forward post, the rear components will be laminated from 2 strips measuring 7/8 x 1 1/8 x 67 5/8 inches. The two end panels will be designed with the raised panel section recessed by exactly 1/4 inch at the front and rear posts. However the inner faces will all be flush so that after construction, the shelves can readily be inserted. The next step is to prepare the joint related to fitting the raised panel to the front and rear posts. With respect to the front post, the fluted frame has been laminated to a strip measuring 7/8 x 1 1/8 x 67 5/8 inches. For this we use the extended distance gauge set at 14 9/16 inch. We reference from the top using the check marks and X’s and drill through guides 2 & 3. Insert the extended distance gauge in the last hole, clamp Dowelmax and drill holes 1 & 2. Continue along the 6 ft. board to the far end. 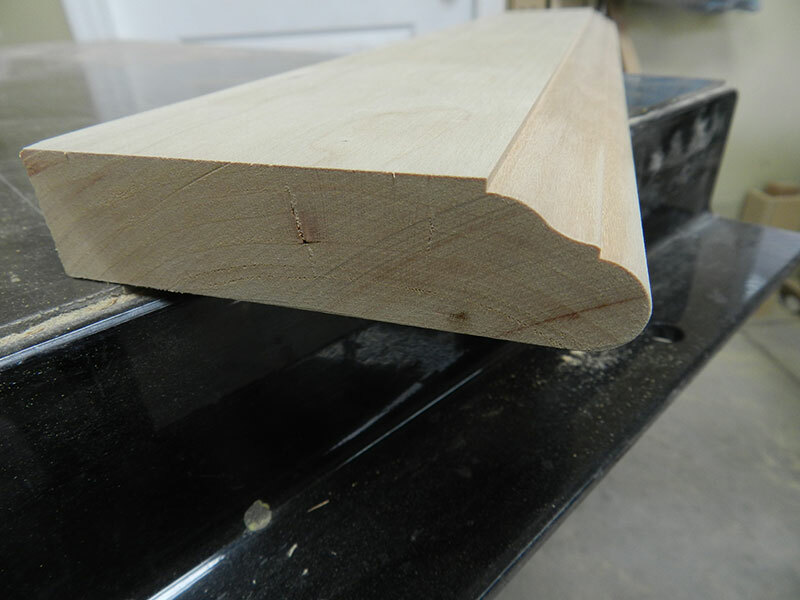 The next step is to join the raised panel section to the front post, recalling that the raised panel has a relief or offset of exactly 1/4 inch. Leaving the extended distance gauge at the same setting, i.e. 14 9/16 inch, again mark the reference marks at the top end, however in this case we are referencing from the back face rather than the front face (these 2 faces are intended to be flush in order to allow the shelf to be slid into place following construction. The raised panel is 7/8 inch thick, so install the 1/16 inch washers within Dowelmax between reference bracket and reference block. 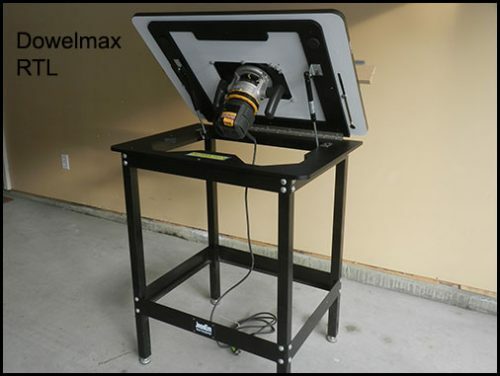 Set Dowelmax at the top of the panel and in order to avoid fouling of previous drilled bores, drill through guides 4 & 5. Use the extended distance gauge at the same setting, install and clamp Dowelmax and drill through guides 1 & 2. Continue along the board placing 1 dowel only at the bottom end. Use an offcut of the same size of wood to ensure the scallops are centred properly and take 3 passes to complete the procedure. If staining the final piece, it is especially important to complete a pass through the router without hesitation or stopping. This will prevent burning or altering the surface texture which could show after staining and finishing. The next step is to cut all the rails to the proper length. It is of course not only important to get the lengths correct, but also to get all lengths the same. I prefer to use the table saw for this procedure, rather than the shop saw, in order to obtain the optimum accuracy. I use the table saw and the fence with a 1 inch spacer. Making sure the table saw blade is absolutely vertical, adjust and use the sled to get a perfect 90 degree cut off one end. 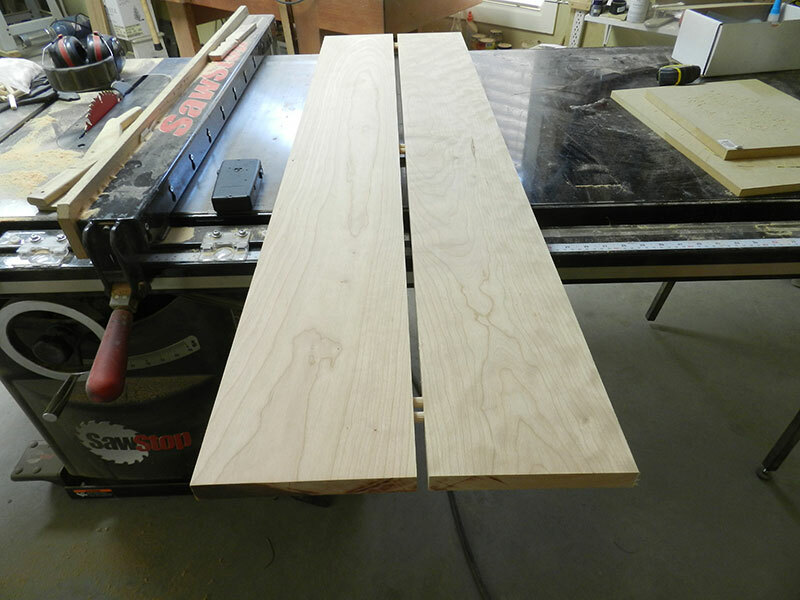 Rotate the work piece, set the table saw fence to 48 1/4 inch (the actual cut is 47 1/4 inch). It is crucial to remember that with this type of setting, it is really important to ensure that the sled is in the exact same position for each individual set up. 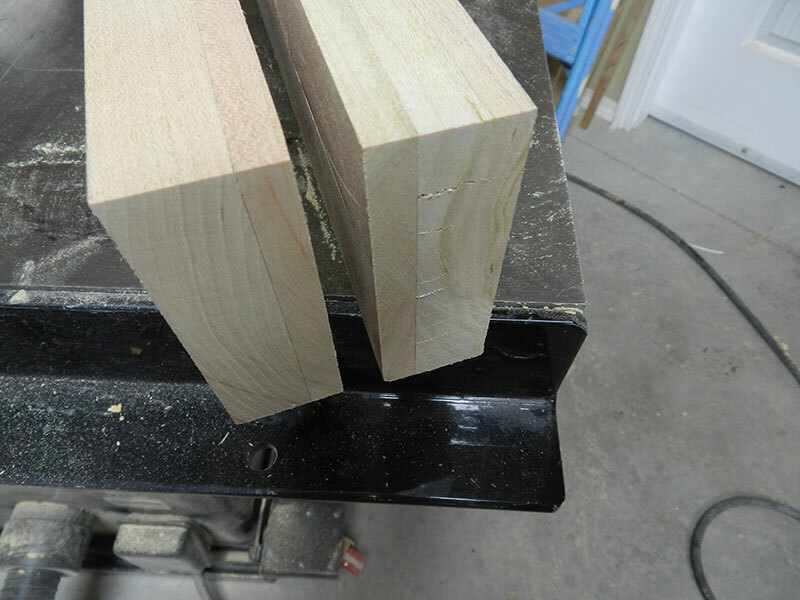 CAUTION: THE 1 INCH SPACER ABUTTING THE TABLE SAW FENCE MUST BE REMOVED PRIOR TO MAKING THE CUT. The next step is to determine the spacing and setting for Dowelmax in positioning the 6 transverse rails. As previously stated, the extreme upper and extreme lower rails are 2 1/8 inch in width to accommodate 3 equidistant dowels. In this case I intend working with the extended distance gauge from the top end to the second bottom shelf. The lower rail will be referenced from the bottom. It should be noted that when referencing from two areas, i.e. top and bottom, it is essential that both corner posts be identical in length. As a consequence, these require to be trimmed before completion of the shelf positioning. The thickness of the wood is 7/8 inch, so install a 1/16 inch washer between reference bracket and guide block to centre, i.e. width halved less 3/8 = 1/16 inch. In this case we reference from the front and top end using the extended distance gauge at 10 11/16th. 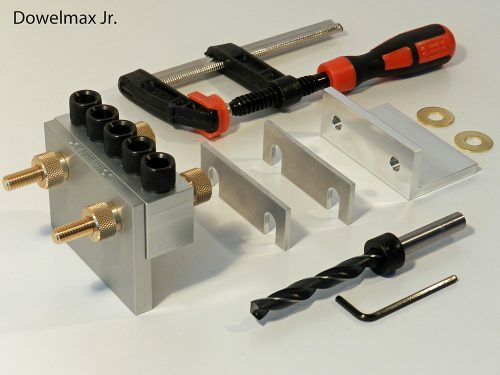 Set Dowelmax and drill through guides 1, 2 & 3, insert the extended distance gauge in bore #3, ensure the rod is level, set Dowelmax, clamp and drill 1 & 2 for the first shelf. Install extended distance gauge in bore #2, then bore the next 2 shelf holes (second shelf). Install extended distance gauge in bore #2 then bore the next 2 shelf holes for the third shelf. In order to ensure the shelf rails are true and level, we do not adjust the extended distance gauge at that time, and proceed to carry out the same procedure in the opposing corner post. Once the position of the 4 transverse upper rails has been completed, install 4 snug dowels, fit the two corner posts together and check for alignment by ensuring the ends remain absolutely flush. These two rails are placed at the extreme upper rear section of the raised panel ends, and the bottom section of same. 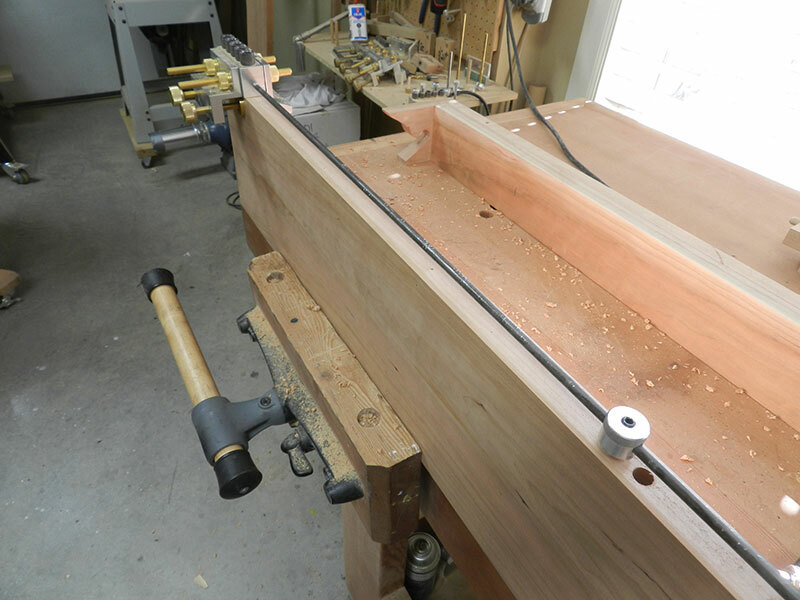 Each rail measures 7/8″ x 2 1/8″ x 49 9/16″ and each joint incorporates 3 dowels. Ensure that the lengths of the two book case ends ??????? so we can reference from the top down, and the bottom up. The rail is 7/8″ thick, so again, use the 1/16″ washers to centre on that size of stock. For this procedure, Dowelmax can be used either in its normal configuration, or in the face configuration for these joints. Mark the reference marks carefully. The book case is approximately 6 feet tall, and for that reason, the top will be relatively plain. There will however be a mitred edging approximately 3 1/2″ wide. 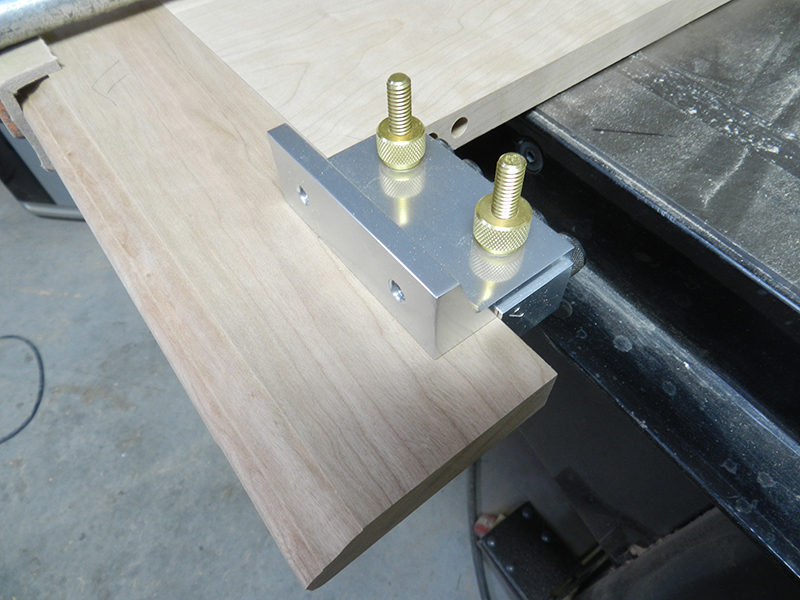 The top plate minus the mitred edge will measure 7/8″ x 13 1/8″ x 50 3/8″. 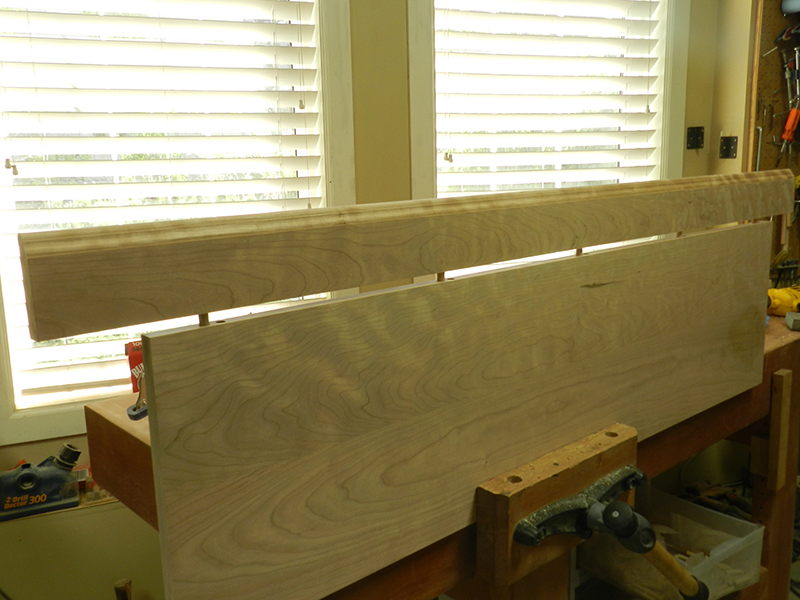 I joined 2 pieces of cherry to make up the 13 1/8″ width and used 6 dowels for the long join, i.e. 4 approx. 3″ in from each end and 2 at the centre. I don’t have a jointer, however I have found that the table saw performs this function perfectly adequately. 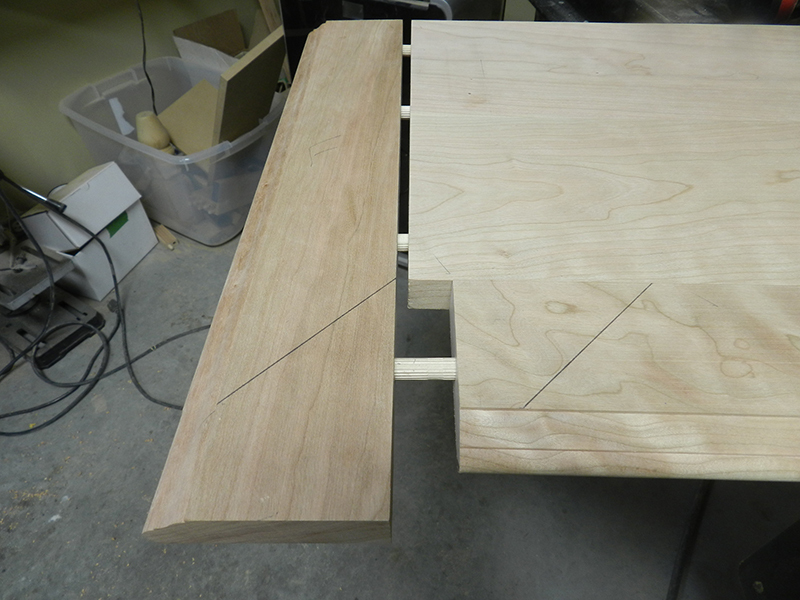 Once the rough edges are removed I make several cuts approximating 1/32″, rotating the boards 180 degrees for each cut. Eventually small abnormalities are removed and the join when completed, is virtually seamless. Place the boards together, carefully mark the reference marks at the upper end, use 1/16″ spacers and the extended distance gauge set at 20 1/4″. Drill into guides 4 & 5, place the extended distance gauge in the last bore, again drill 4 & 5, follow the same procedure to the opposite end and in this occasion, drill 1 & 2. Glue all surfaces using a 5/16 inch diameter artist’s brush, coating all mating dowel and inner peripheral surfaces. Use soft pads and suitable clamps. 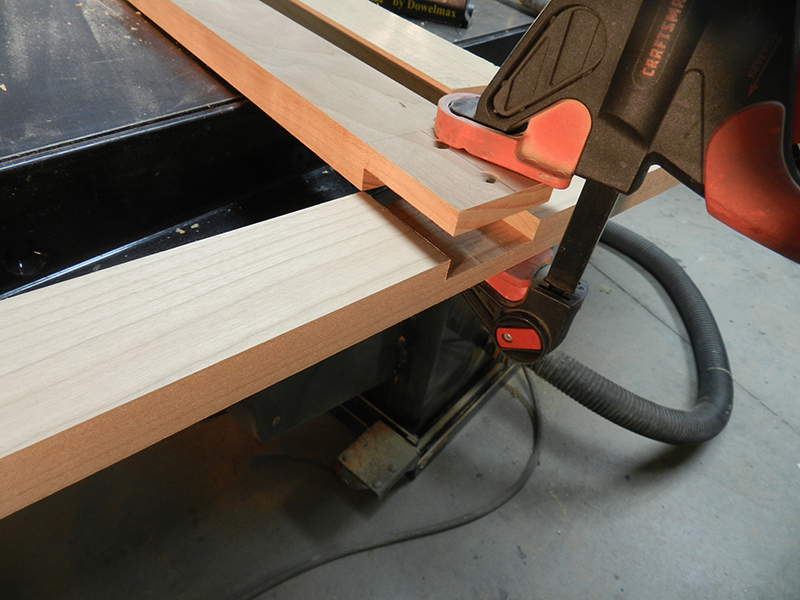 After clamping, use straight edge to ensure the top surface is flat, and use wedges and/or bar clamps to rectify any discrepancies. I use 3 to 4 pipe clamps for this procedure, placing 2 of these at the extreme ends of the work pieces. The sides and edges must be prepared to accept the edging and these must be absolutely true and fair. 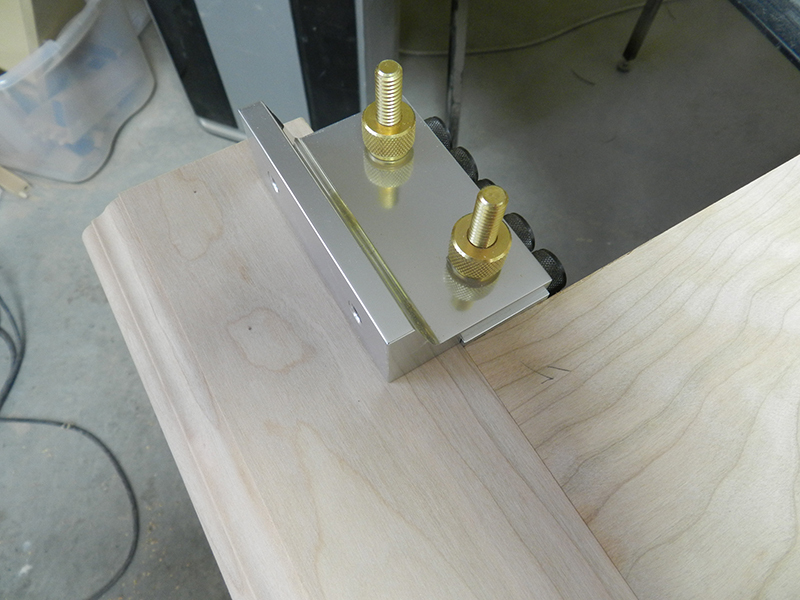 On the table saw, reverse the top plate, taking off 1/32nd or less on ach edge until a true fair edge is attained. Follow the same procedure with the longitudinal mitred edge piece. With respect to the ends of the top plate, these are a tad more tricky due to the width and length (table saw) and I am reluctant to use the mitre saw for something requiring absolute accuracy. I will therefore use the router with a high quality aluminum fence. 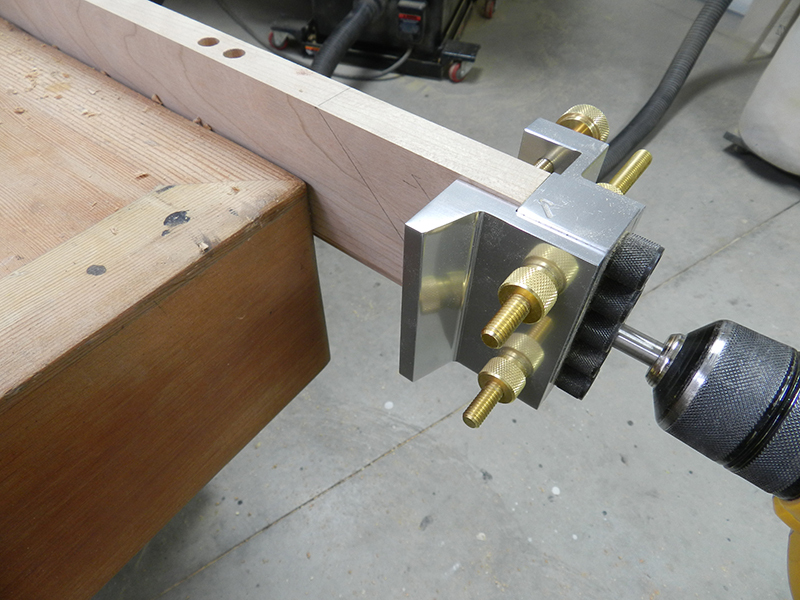 The fence is secured to the end of the work bench utilizing spacers the same thickness as the top plate. A 3rd clamp is used to create pressure between the aluminum fence and the top plate, to ensure that the latter remains immobile. Use a good quality set square to ensure the fence is absolutely perpendicular with the longitudinal edge of the top plate. In conjunction with a suitable carbide tipped straight bit, work from left to right, make small cuts and use a piece of painter’s tape at the end in an attempt to reduce tear out. The 3 ends/edges are now prepared for fastening the 3 1/2 inch mitred edging. Begin with the mitred longitudinal. The length of the wide top plate is 50 3/8 inches and remembering the 45 degree angled ends of same require an additional 3 1/2 inches of length for each end. The total length of the mitre strip should be marginally over 57 5/8 inch (57 3/4 inch) allow an equal overlap at each end of approx. 3 9/16 inch. Use the scribed line and the end of the top plate to reference the edge of Dowelmax. Set the extended distance gauge to 9 5/8 inch. gauge rod, drill 1 & 2, repeat process along work piece until last setting, and drill 3 & 4 (photo 3029). 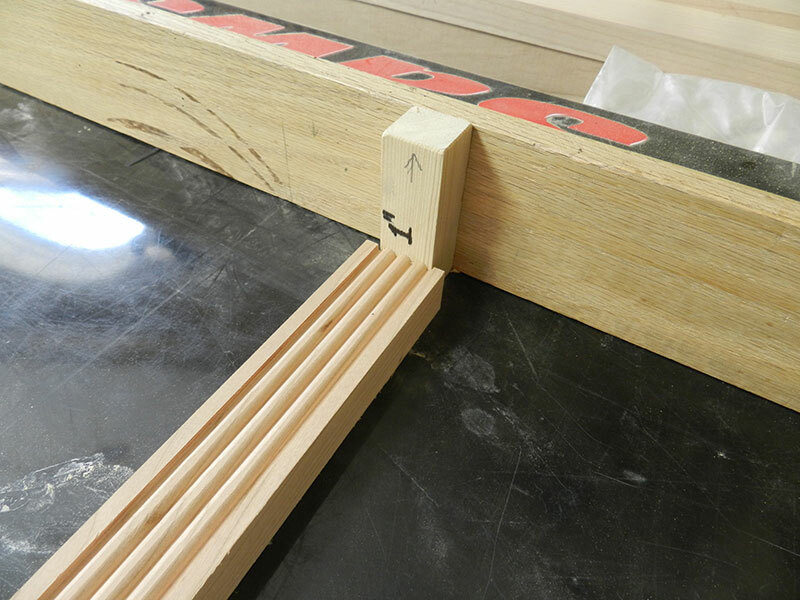 Follow the same procedure with the wide top plate, beginning at the left edge (check mark), drill through guides 3 & 4, continue with the same procedure as for the mitred trim. Before dry fitting the trim and top plate, remove both scribed lines at junction with top plate and trim. Dry fit using approximately 50% of the dowels and close joint to ensure proper fit before reapplying scribe marks at each corner. 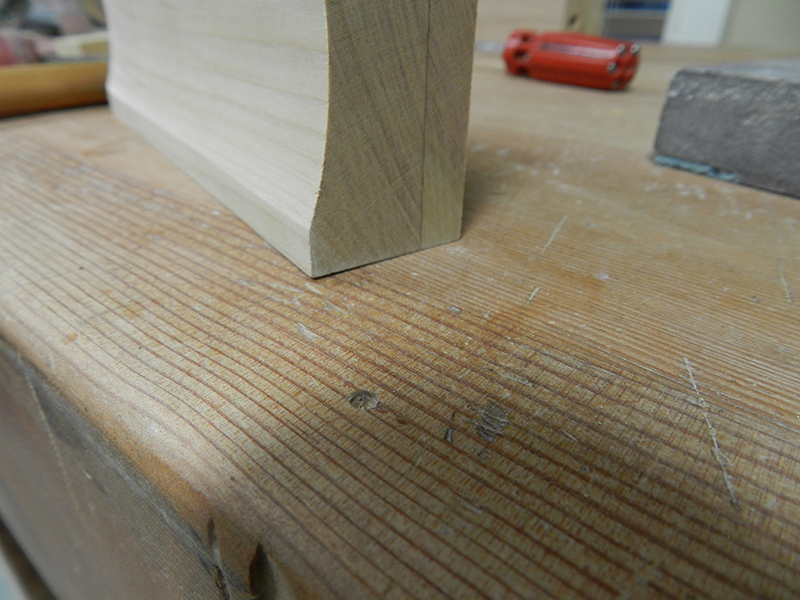 With this type of mitred trim, I like to reinforce the mitre connection with one or two dowels (one would probably suffice). Normally when we join a mitre joint using Dowelmax, the device is set with the guides absolutely perpendicular to the mitre surface. However as a consequence of the axis of the dowels on the edges and ends, this is not possible. In other words some of the dowels would be set at an angle of 90 degrees, whereas the mitre joint would be set at 45 degrees. 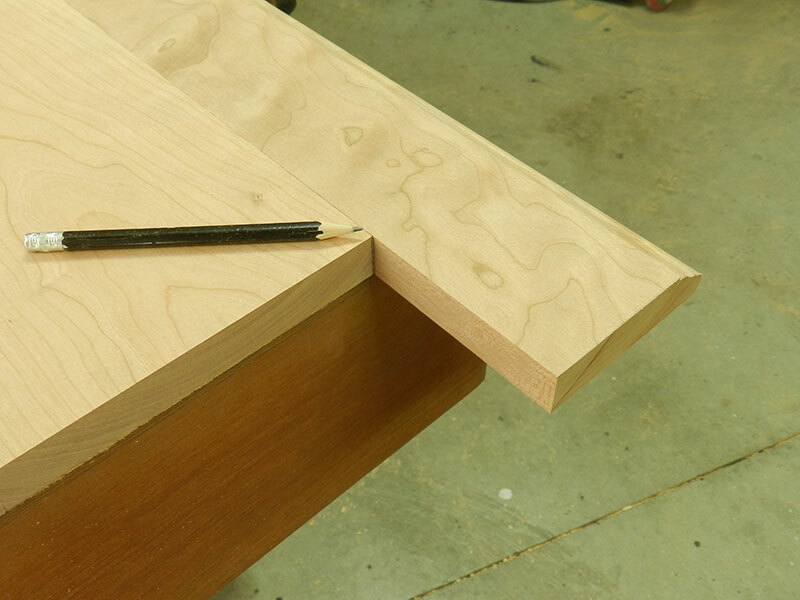 We have therefore to align the mitre dowels in the same axis as the routed end trim (see diagrams a & b). Implement two procedures prior to drilling, (1) ensure routed trim ends are perfectly perpendicular to the longitudinal axis of the rail, (2) scribe a line coinciding with the original scribed line. Reference Dowelmax to the inner edge of the rail, and also to the top. Drill through guide #3 and using the 45 degree scribed line, ensure depth of the drill hole is approximately 1 inch past that 45 degree line. The next step is to follow a similar procedure for the end routed trim. Install check marks at the rear faces and ends/edges. Reference Dowelmax to rear end and upper face. Clamp and drill. 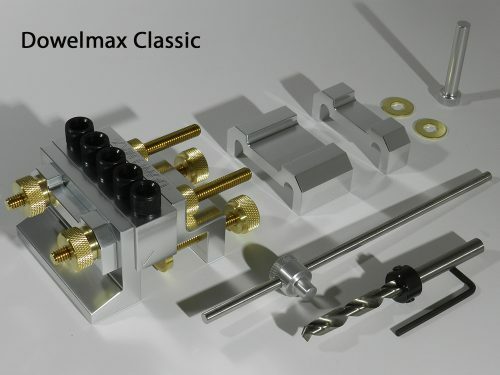 Set distance gauge to 3 1/2 inches, align Dowelmax with rod and drill guide #1. Move distance gauge along, align rod with Dowelmax and drill through guide #3. Reference to the top and rear edge of the top plate and perform the same reference and drilling procedures. At this juncture, my 3/8 drill required to be sharpened. A quick method for setting the proper depth, the drill is inserted and rotated until the scribed line. Align the screw to the scribed line. Tighten both screws. Following drilling, dry fit the assembly, following which, Dowelmax is clamped to the routed rail with the block firmly against the top plate, and again referencing from the top. (dry fitted assembly) with scribe marks indicating the mitre cuts. Once all the bores have been drilled to accept the 3 routed rails, the next step is to cut the 4 mitres. Begin with the longitudinal routed rail, install 3 dowels (ends and centre) dry fit to top plate, scribe 2 marks on longitudinal routed rail to correspond to the ends of the top plate. Use these marks as a guide for the mitres. Before proceeding, perform test cuts and adjust mitre gauge to attain perfect 45 degree angle. Make several passes, constantly dry fitting to ensure inner corner of mitre aligns with end of top plate. Remove any dowels from the short routed end rails, then cut mitre on rail, short of the finish point (approximately 3/8 to 1/2 inch). Adjust angle if cut until a perfect match with the longitudinal 45 degree mitre is achieved. Maintain mitre gauge setting and with great care, making several passes, until perfect alignment has been achieved. The design incorporates a rear centre vertical. The component measures 7/8 x 2 1/8 x 71 inches. This component will be firmly secured to the upper and lower rear rails and will not be attached by dowels, but merely 4 screws, since it may be necessary to remove the vertical in order to install or remove the various shelves. The vertical component is required for two reasons, (1) structural rigidity and (2) shelf support. Each shelf will be supported by an angle bracket to prevent sagging as a consequence of heavy books. For that reason the vertical member will extend below the lower lap joint to the floor. The lap joints should be undertaken using a good quality dado blade, and before changing the blades over, ensure that the power is disconnected. I used my 2 track shop made sled to cut these joints. With the exception of the upper and lower decorative routed rails, the main structural components are now complete. We can now consider methods for preparation, staining and lacquer. As I have said in previous projects, I prefer individual preparation and staining of the various components before assembly. These are basically, the top plate, the 4 posts, the completed rail and stile ends, all transverse rails and the Chippendale feet. Whilst the finish is, in my opinion, better with this method, it is of course time consuming. I have constructed a simple adjustable stand in which the various components rotate for prep, staining and applying the lacquer or varnish. First I prepare the prep solution: 1 part amber shellac with 3 parts methyl hydrate. Sand all book case components, finishing with 220 grit. With this method we do not wish the stain to adversely affect glued surfaces. All these are carefully covered with painter’s tape. 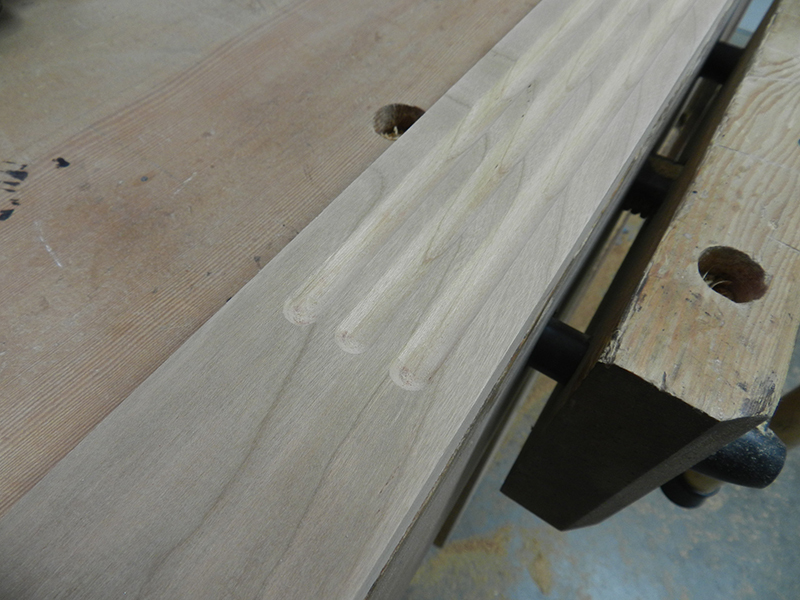 Each component is centred on the stand after sanding, and the prep solution is applied. Apply with the grain and rub in until dry. After curing, use ultra fine steel wool to smooth the surface (working with the grain). Apply 1 coat of mixture dark walnut to espresso in equal quantities and apply as before. Apply 1 coat of espresso with the grain, as before. Allow to cure overnight. Finish with top coat as required. I normally prefer water based lacquer.